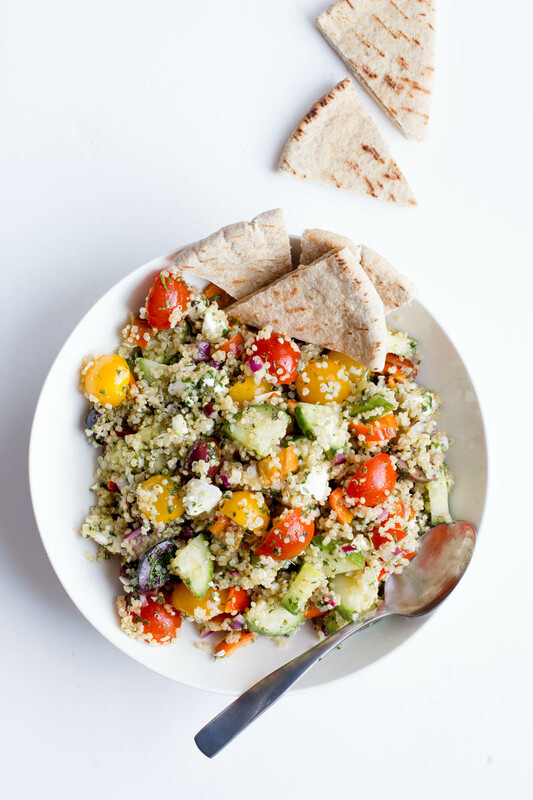 This Greek Quinoa Salad is the perfect vegetarian lunch or a great healthy side dish! Make up a batch on the weekend and eat on it all week long. A Greek vacation would have pretty much everything that makes me happy. Beautiful beaches and water, amazing historical sights, breathtaking scenery and incredible, healthy stupendous food. You knew that last one was going to be in the list, didn’t you? I don’t see a Greek vacation happening anytime in the foreseeable future but I will someday make it onto my well-researched two-week Greek Isles cruise (swoon). For now, I have to just try bring a little bit of the Greek lifestyle into my deeply American world. And the best way I know how to do that? Good wine and good food. 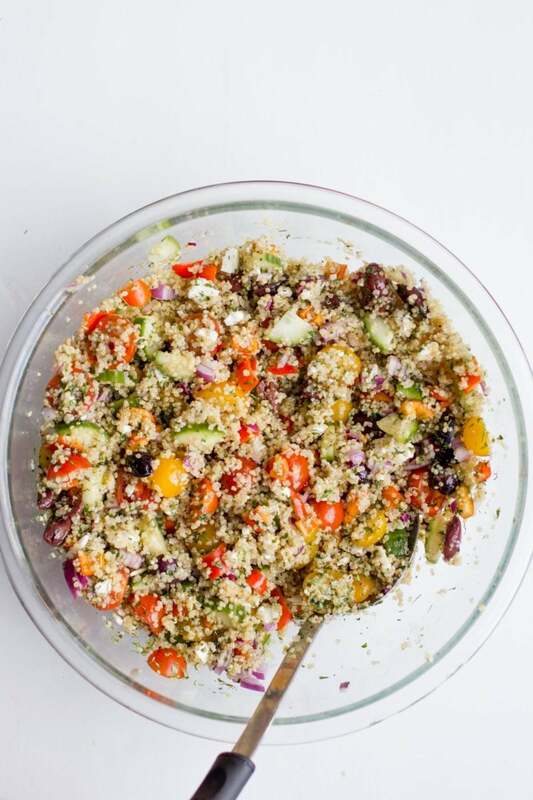 The stars of this salad are sweet tomatoes, creamy feta and salty olives, but the humble quinoa base deserves praise, too! Quinoa is such a magical little grain. It’s one of a handful of sources of complete vegan protein—which means that it provides all the amino acids that aren’t made in the human body (called the essential amino acids). Quinoa is available at most grocery stores now-a-days, but if you can’t track it down—here is my favorite brand that is available online. 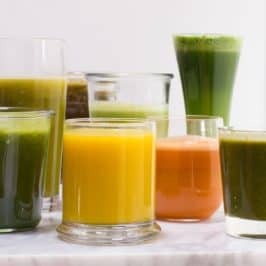 Many vegan sources offer incomplete protein (meaning they have a few of the essential amino acids, but not all of them) but for your body to truly benefit from protein, you need the whole amino acid package. 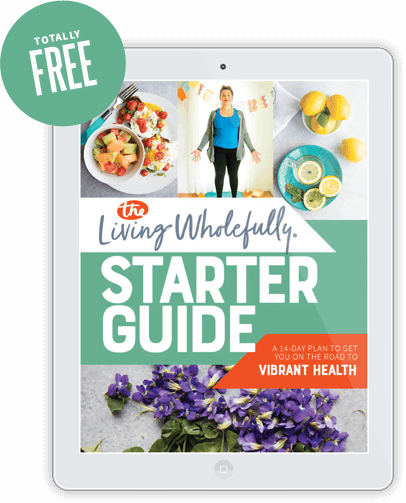 Normally you have to hit up an animal product to get all of the essential amino acids, but quinoa comes to the rescue and delivers them all in a delicious, nutty, chewy, vegan package. Yay, quinoa! We made this recipe for dinner and then snacked on it for days for lunches. It was a great main dish for my bento boxes. This would also make an amazing contribution to a potluck or cookout. People will be asking for the recipe, I promise. We served ours with a nice pile of crunchy pita chips for dipping. 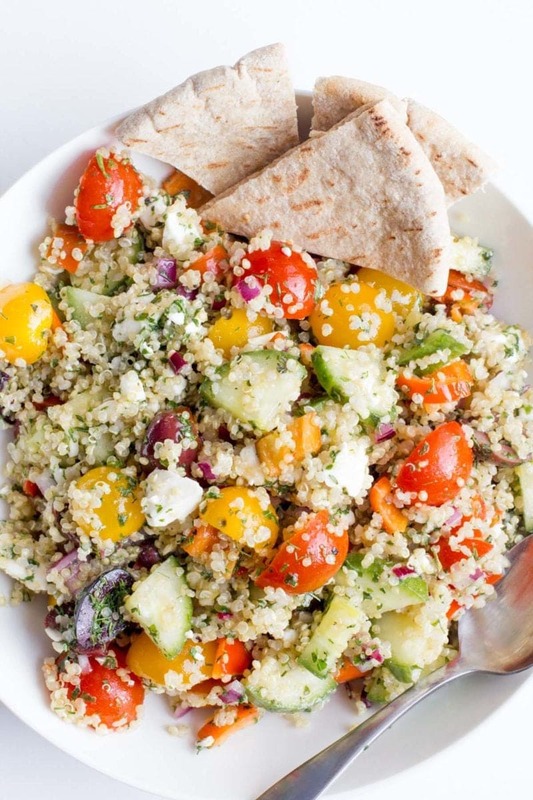 In a large mixing bowl, combine cooked quinoa, cucumber, tomatoes, red pepper, parsley, onion, olives and feta. In a small bowl, combine olive oil, red wine vinegar, oregano, dill, salt, pepper, honey and lemon juice. Pour over salad and stir to combine. 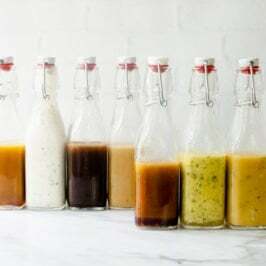 Refrigerate for at least a half hour to allow flavors to meld. This is exactly what I wrote on the hodgson mill giveaway this morning! Delicious treat and wholesome food. But your is much better and richer! Love it! I made Greek-themed lunches at least twice a week (due to my debilitating spanakopita addiction), so this is definitely going in the rotation. I know my family would love it too! Yum! This is going to sound so strange, but I have a quinoa greek salad recipe all done and waiting to be posted but I keep putting it off! I feel a bit weird posting it now so I’ll put it off some more, haha. Yours looks way better than mine anyways, I love the colors. Greek salad is awesome! We’ve been eating it, plain, with pasta, with quinoa for a couple days every week for weeks now! 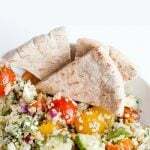 I love Greek food and quinoa is delicious! Thanks for this recipe, I’ll be doubling it to have for lunches next week for the fiancé and I! I like the idea of having some pita chips for dipping too. I know what I’m making for dinner tonight. This looks great, as do all your recipes. Congrats too, on completing your walk – way to go! Not sure if this indicates a good photo, good recipe, or both, but I want to take a big bite out of that close up of this salad. I’ve been wanting to try quinoa and this looks like a good place to start. Yum! What a great way to turn Greek salad into a more substantial meal! My dream travel destination has been Tokyo for quite a few years – and I’m finally going there in September! Yum! Makes me feel like I am already on that cruise. Cassie, I made this for dinner tonight, and it was glorious! So easy to make, and delicious. Definitely a keeper! Hello, This looks delicious! Just wondering if I was to prepare this on a sunday for lunch during the following week how long would it keep for in the fridge? Do you have an idea how many calories in each serving size? This is a lovely way to turn a salad into a full meal! 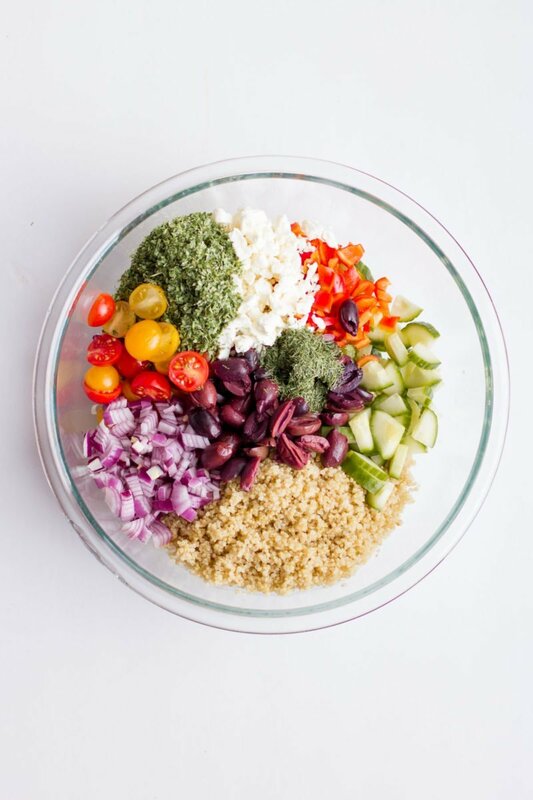 I loved the idea of adding quinoa as the basic ingredient for the greek salad and the taste was amazing! YUMMY!!! I am for sure pinning this to make for dinner one night this week. Love Love Quinoa!! 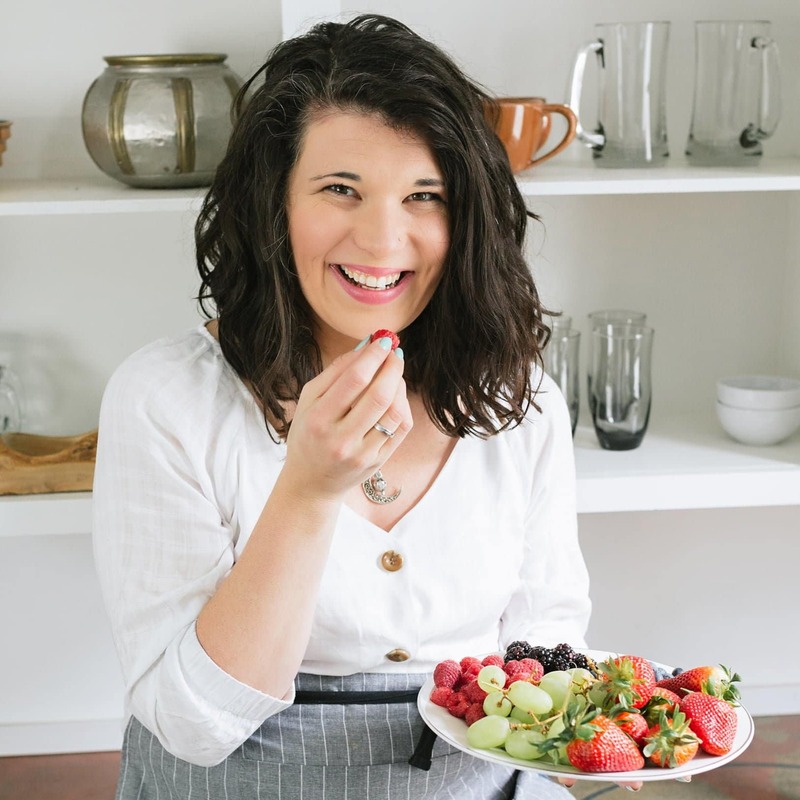 Swoon – all of my favorite stuff in one salad! I need to try this soon. I love the look of this salad! I’m such a fan of cold salads and it’s a great way to use up quinoa. Ok…don’t take this the wrong way, but I love you!! This recipe is the one that made me finally try quinoa. I know…SO late to the party! But, this salad makes me feel like the overnight oats did you – totally excited for mealtime so I could dig in!!! This was really, REALLY good! Of all the “healthy”, “real food” recipes I’d pinned, this is the one I chose to kickstart my month of HealthIER eating. Thanks so much for the wonderful recipe!! This looks equally healthful and delicious. I’ll be trying this (and blogging about it too!) for a picnic this weekend! Okay, so I know it takes the “Greek” out of it, but we do not like feta, olives or parsley in our home, so we left those ingredients out and this was AMAZING. I could not stop eating it. Husband loved it. Kids loved it! Great recipe! Brought some today for lunch. Mmmm. Thank you! We make a recipe much like this, and sometimes it gets stuffed into hollowed-out acorn squash, topped with extra feta, and baked until the squash is done. YUM. WOW this is an amazing dish. The flavors are so great. Thank you for this!! Around how many calories are in 1 serving. Hi Cassie! 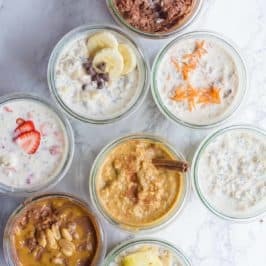 I am so enjoying that I found your website today, thank you for all your amazing recipes, I’m testing one of your overnight oats tomorrow morning (I just made it). 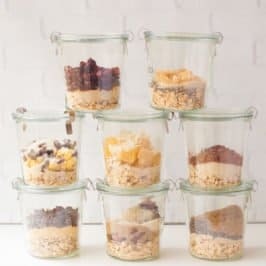 I love quinoa but haven’t cooked it at home for ages so the tip about freezing it should be so handy for us. 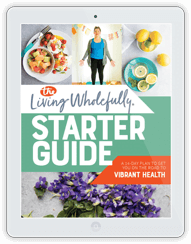 My hubby and I are both veggies so I’m always happy to find new ways to get a fuller profile of nutrients into us. My hubby cooks as he gets in before I do but he would be the first to admit his repertoire is a little limited! We just moved over from a weekly queen bolognaise to using lentils instead, so I reckon a swap out of quinoa for rice with our bean chilli, curries or Chinese stir fry would totally work. 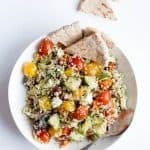 I love the Greek quinoa salad recipe too, looks great for our veggie barbecues, can I ask if it’s still gluten free if you add the dressing as my closest friend is a coeliac – yeah we have great fun eating on holidays! Welcome!! And yes, the Greek quinoa salad is still gluten-free with the dressing! Oops that last post said ‘queen’ instead of Quorn! Sorry! Hi are Kalamati olives a must or can you use black olives? Kalamata will give you the best flavor, but black olives will work in a pinch. Just made this and WHOA I love the flavors! 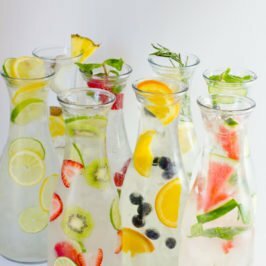 Thank you for the tips and tricks of meal planning! I am ready and excited to keep going!! I’d say you could get a week out of it, no problem.